An article about the firing of Toronto Raptor's head coach, Dwane Casey. AN END OF AN ERA: The Toronto Raptors fired head coach, Dwane Casey, (Top), yesterday after seven seasons. To no surprise, but after seven years of being head coach of the Toronto Raptors, Dwane Casey was fired yesterday. Team president, Mosai Ujiri said yesterday in a press conference that firing Casey was the hardest thing he has ever done. The firing happened about a week after the Raptors were swept in the second round of the playoffs by the Cleveland Cavaliers. Casey, 61, was the franchise's successful coach of all time. With Casey at the helm, the Raptors won four Atlantic Division titles in five years. 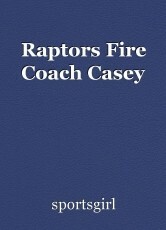 The Raptors also had three consecutive 50-win seasons with Casey as head coach. There's no replacement at this time. Marner Scores Two In Leaf's Win Over Sens. This page was created in 0.4034 seconds.